How far does a dwarf-hamster run during a night? Category: Biology. Tags: hamster, measurement, running. Hamsters are very active animals. When kept in cages they often have access to a running wheel. They spend much of their nights running this wheel. But how far do they actually run? We instrumented the wheel by a bicycle computer. The results from a few weeks are displayed in this graph. 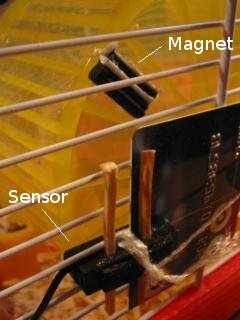 The magnet was fastened to the wheel by a thread and the sensor to the cage wall,also by a thread. Two wood sticks were put through holes in the sensor to obtain the right distance and angle towards thepassing magnet. The sticks are pressed towards the wall by the thread. One of the sticks is lifted from the wall by a plastic card with a cut-out for the sensor to get the right angle. It is important to mount the sensor correctly relative to the passing magnet, they shall be parallel and pointing towards the wheel axis of rotation. The maximum distance between them is a couple of millimetres. You can hear a click in the sensor when triggered by the magnet. The computer must be correctly scaled. First you must find the circumference of the wheel. Measure the wheel inner diameter, in our case this was 135 mm. Multiply by 3.14 to get the circumference, in our case 42 cm. This is probably too small a value for the computer, so we must multiply by a scaling constant. We chose a scaling constant of 20 to get maximum resolution, and programmed the wheel diameter to be 840 cm. In this way we made the computer believe that one revolution corresponds with a distance of 8.4 m metres. So, when reading the result from the computer’s trip counter we must divide by the scaling factor, in this case 20. If the display indicates 160 km, the real distance run by the hamster is therefore 160/20=8 km. You must be sure that the computer detects only one pulse for each revolution, else the indicated distance will be far to long. First,determine how many revolutions we have per km, i.e. 1 km/circumference. In our case we have 1000/8.4=119. Reset the trip counter and run the wheel by your finger. Count the number of revolutions it takes for the computer to display exactly 1 km. The number of revolutions should be equal (or at least nearly equal) to the calculated value. Don’t they show up to taste some water or even food? We bought a ‘live trap’ for small rodents to help catch our hamsters when they’ve gotten loose, it really helps. I think ‘haveaheart’ is our brand. It’s a little wire cage with sort of trap doors on the side, totally safe for the hamsters. If they come out at night for food or water like Oao suggested, oyu might be able to catch them with a trap like that. I created a tiny website to measure the performance of my hamster and plot the data on different graphs.